Nile boats now ply this 220-kilometer stretch of the river more than any other, so it is well known to latter-day travelers with its two important towns of Esna and Edfu. The temple at Esna was for centuries buried beneath the houses of the town and used as a storehouse, seen only by local people and a few adventurous travelers. In 1842 Muhammad ‘Ali ordered that the hall of columns be dug out, but it was many years before the temple was fully excavated. Calmer and more easily accessible is the temple at Edfu, which Michael Haag describes as “pure theatre” at which the visitor might cry out, “Cecil B. de Mille, they have outdone you!” At Kom Ombo the temple of Sobek and Horus stands prominently on high ground overlooking the Nile. At the end of this stretch of a Nile journey is Aswan a smiling, lively city. It has a sense of being less concerned with the distant past, more concerned with government and commerce, and the to-ing and fro-ing of peoples. 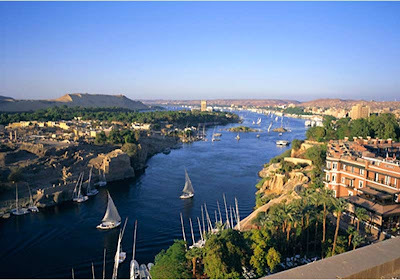 The Nile here seems more sparkling as it flows in a narrower bed created by the islands of the First Cataract and all day long the white-winged sails of the feluccas speed along its surface.